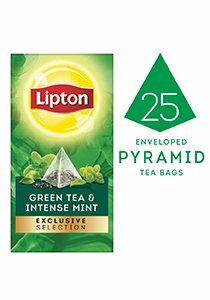 Why does Lipton Green Tea and Intense Mint taste so good? Because the roomy pyramid bag lets the refreshing herbs infuse beautifully. We include large pieces of plant for a fresh and natural taste. Ambient (Store in a cool,dry place), Max 25°C.